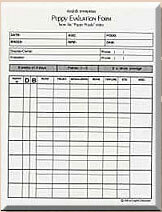 Puppy Puzzle Video, Dogfolk Enterprises, Inc.
chart the progress of your litters. 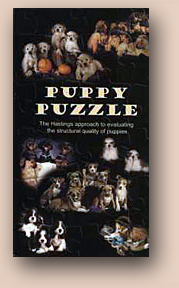 Puppy Puzzle is the approach developed by Bob and Pat Hastings for the structural evaluation of puppies. It addresses both the parameters of the evaluation process, as well as how to evaluate for decisions and answers. The process discussed in this video has been used by the Hastings to evaluate over 250 litters per year. For years they have documented each evaluation and have been amazed at the accuracy of the process. See what it can do for you and your breeding program!